The idea for this came from Temechegn Engida in Ethiopia see http://tinyurl.com/nxuyotr. There is both and open and closed version. It also acts as a hand-held crucible. So a mixture of copper or iron(III) oxide with carbon can be placed in the crucible, heated strongly and placed lightly on the surface of water, not sinking it. The quick cooling of the contents stops and re-oxidation of the metal. The copper can be seen as a red solid. 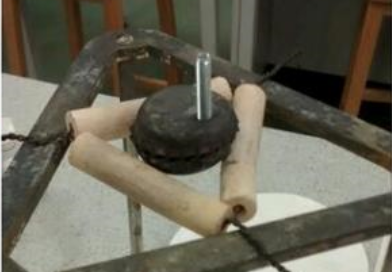 The iron can be placed on paper with a magnet underneath. I was surprised to learn that porcelain crucibles were designed to use only once. Cost though dictates that they are repeatedly used. They easily break and manipulating the lid is difficult. 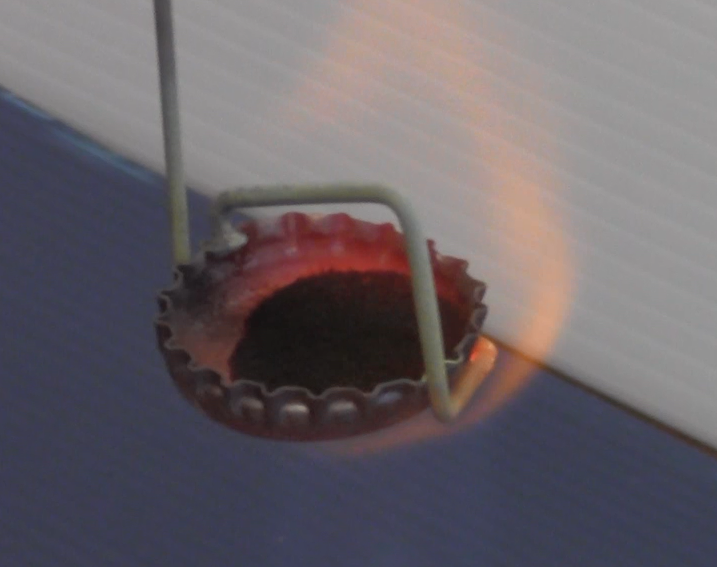 The bottle top needs to be heated in a hot Bunsen flame in a fume cupboard to remove the plastic insert. For "sandwich" allows magnesium to oxidise with little loss of the oxide. By inserting a bolt and nut, the "crucible" can be held with tongs or pliers. Reduction of metal oxides with carbon can also be carried out with the "held" design. Less than 0.2 g of the metal oxide is intimately mixed with about one third the weight of powdered carbon. This placed in a bottle top which is drilled and bolt is placed through it. Holding the bolt with tongs or pliers, is heated strongly in a Bunsen flame and once the reaction is finished, it is dropped into a beaker of cold water. Copper can be seen by its colour and iron can be removed with a magnet. Powdered zinc may also be used but do not be tempted by more active metals. The arrangement can also be used to find % or mole ratio of water in hydrated salts. No need to use a Bunsen but a spirit burner is better because it avoids the sulfate decomposing further to give off sulfur dioxide and trioxide. This equipment can be made for less than £20. The large scale equipment costs with Platinum electrodes over £150. Holes are made in the Petri dish with hot wire. The platinum electrodes is soldered to copper wire but the connection is not secure until it is encapsulated with glue from a glue gun. 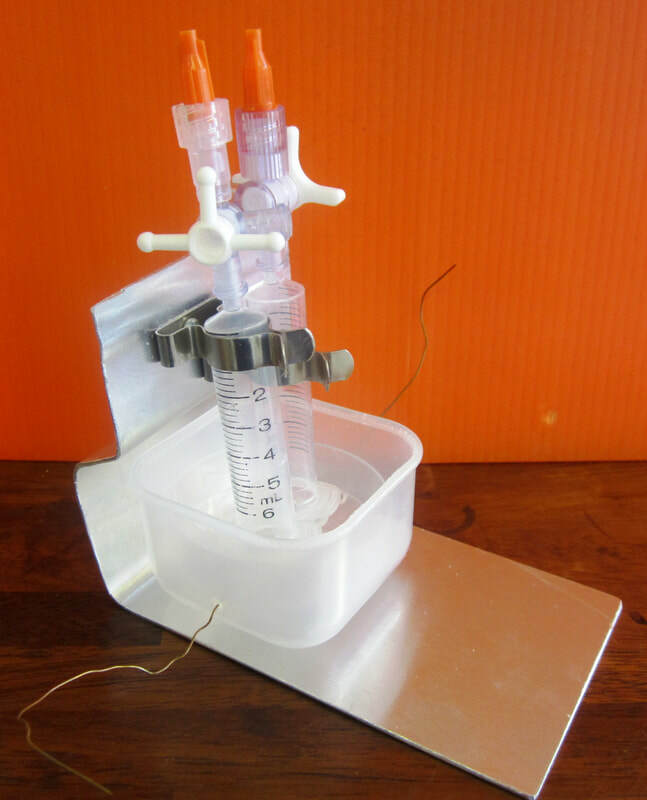 The 3-way taps allow you to pull the electrolyte (sodium sulfate(VI) solution) up the syringe and more importantly remove the gases after they form for testing. The ratio is 2 parts hydrogen to 1 part oxygen, usually better the second time of running as oxygen needs to saturate the solution. This is the latest version but one built a couple of years ago is on http://tinyurl.com/m7em9fy. With this equipment we can test for gases, carry out quantitative measurements by inserting an ammeter in the circuit, make explosions and fire little projectiles. The electrolyte is saturated sodium sulfate solution so by adding bromthymol blue indicator, the formation of an alkali at the cathode and an acid at the anode during electrolysis can be seen. The standard electrolyte in the large standard equipment uses 1 or 2M sulfuric acid a the electolyte and I fodn it is rather diffiult to interpret the results.. If you run this for a short time, disconnect the battery and attaach a voltmeter, the voltage is very close to the expected 2.057V. very small current which is quiclkly lost.